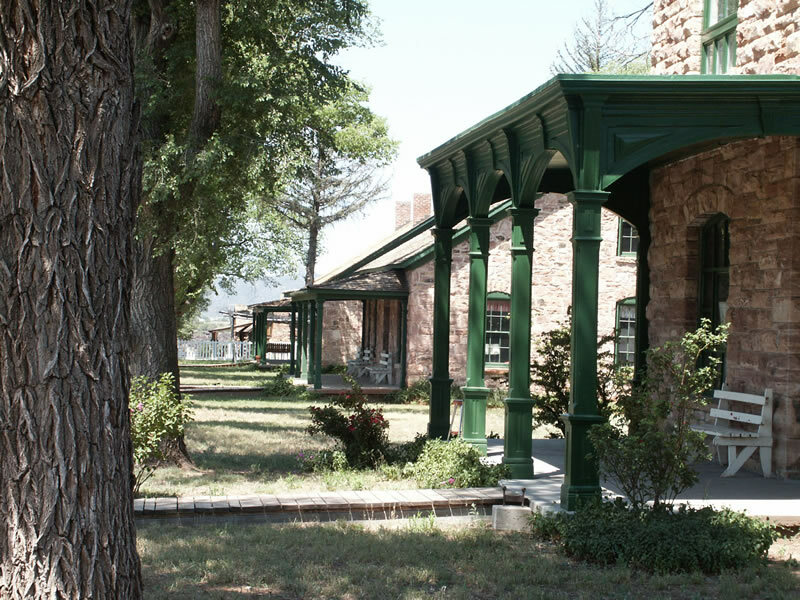 The restored former Officers' Row is one of the historic resources preserved on the White Mountain Apache lands. The 1.7-million acre Fort Apache Indian Reservation in central Arizona is home to the 14,000-member White Mountain Apache Tribe. The reservation contains the 1870 U.S. Army post for which it was named and thousands of sites associated with the history and culture of the Apache and earlier peoples. Fort Apache was been made famous by Hollywood Westerns portraying its role in subduing Indian leaders such as Geronimo and Cochise. After the Army left in 1922, the post was converted into an Indian boarding school administered by the Bureau of Indian Affairs. Over time, many of its historic buildings slipped into disrepair, and it was named to the World Monuments Fund's list of 100 Most Endangered Sites. In the early 1990s, the tribe decided to rescue the rapidly deteriorating frontier icon and convert it from a symbol of oppression into a place to explain the tribe's history to visitors as well as serve ongoing community needs. It has become a hub for heritage tourism, cultural perpetuation, and education. Ten of Fort Apache's 27 historic buildings have been restored through partnerships and funding from the Fort Apache Heritage Foundation, the National Park Service, the World Monuments Fund, the Arizona Heritage Alliance, and others. Also at Fort Apache, the tribe's Culture Center and Museum Facility, Nohwiké Bágowa, houses a growing collection of Apache art, cultural objects, and historical documents. Every other year, the tribe holds the Great Fort Apache Heritage Reunion in a spirit of both celebration and reconciliation. The White Mountain Apache is also working to preserve Kinishba Ruins, an ancestral pueblo community originally built and occupied from about 1150 to 1350 A.D. A National Historic Landmark, the pueblo originally had 400-500 ground floor rooms standing two or three stories high. The tribe's preservation activities are coordinated by its Historic Preservation Officer and its Cultural Advisory Board. The White Mountain Apache Tribe is approved by the National Park Service to assume the functions of the State Historic Preservation Office on their tribal lands.